Saturday, Feb. 13, 2010 – Pizza Party & Euchre Night at 6:00 p.m.
Tuesday, Feb. 16, 2010 – Annual Pancake & Sausage Supper from 5:30 to 7:30. Wednesday, Feb. 17, 2010 – Ash Wednesday Service at 6:00 p.m. The 151st Annual Meeting of St. James’ took place on January 17, 2010. The meeting was held in Upper Latta Hall following the regular Sunday Mass and a carry-in brunch. The Rev. Larry R. Biller, Priest-in-Charge of St. James conducted the meeting. There were 23 members present. Written reports were presented from the Wardens, Committee Chairpersons and the Treasurer. St. James' 2010 Vestry. Front row (l to r): Katie Craig, Rhoda Moriarty, Mill Taylor, Sandy Haberstich. Back row (l to r): Pat Ronison (Senior Warden), Bob McCormick, Father Larry Biller, Brent Rheinheimer, Steve Dudley (Junior Warden). Janet Kercher-Dudley will serve as Clerk of the Vestry but is not a vestry member. Jan. 11, 2009 – Annual Epiphany Brunch at Maplecrest with special honor to Chuck Wicks for his years of service as Sr. Warden, and his election as Judge of Elkhart County Superior Court No. 5. Feb. 24, 2009 – Annual Shrove Tuesday Pancake & Sausage Supper. April 18, June 13 and Sept. 26 – Euchre parties with pizza suppers. July 26, 2009 St. James’ Day Picnic with All Saint’s at Lake Wawasee. August, 7, 8, & 9th, 2009 - 150th Anniversary Celebration. Oct. 10, 2009 – Joint Service and Carry-in Brunch with All Saint’s at St. James. Oct. 14, 2009 - St. James’ Diner’s Club met at Hopper’s Restaurant. Nov. 11, 2009 – St. James’ Diner’s Club met at Peterson’s Steak House. 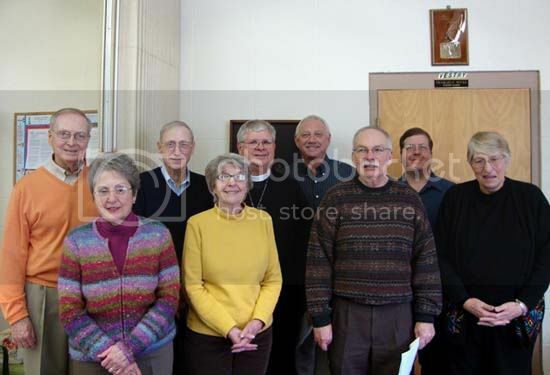 Nov. 12, 2009 – Goshen Historical Society held a dinner meeting and program at St. James’. Nov. 16, 2009 – Annual Holiday Auction. Dec. 6, 2009 – Celebrated Fr. Larry Biller’s one year anniversary as Priest-in-Charge at St. James’. Dec. 24, 2009 – Christmas Eve Mass followed by a reception. 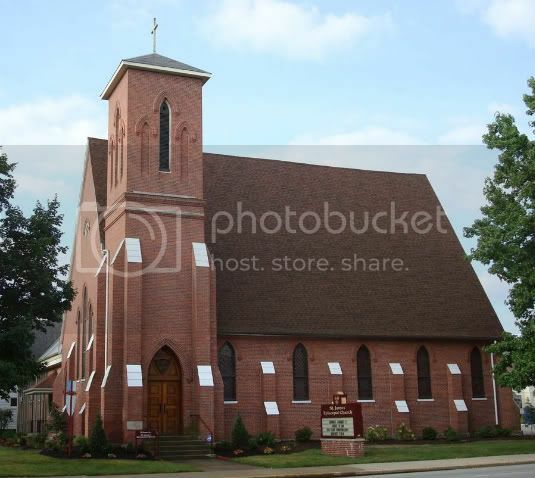 St. James' also had Noon Day Prayer Services twice a month, a rummage sale, and a coffee hour fellowship each Sunday. Having just celebrated our 150th anniversary as a parish in 2009, and welcomed 3 young people into the fold at Bishop Little's annual visit, St. James' looks forward to another year of worship, service, and growth in 2010. On January 3rd, 2010, St. James' Episcopal welcomed The Rt. Rev. Edward S. Little, Bishop of the Episcopal Diocese of Northern Indiana, for his annual visit to the parish. Front: Bishop Edward Little. Rear: Mitzi Hernandez-Walton, Barbara Hernandez-Walton, Fr. Larry Biller, and Jorge Hernandez-Walton. 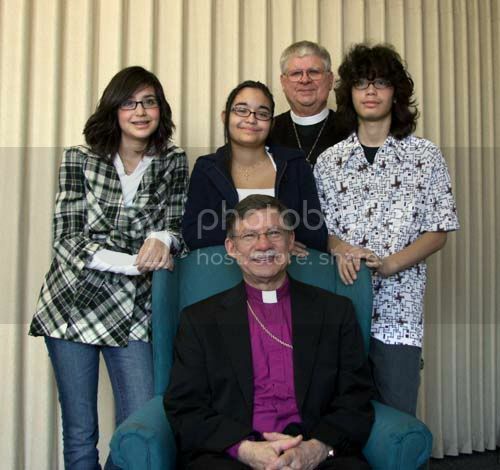 During the service Bishop Little confirmed Mitzi Hernandez-Walton, Barbara Hernandez-Walton, and Jorge Hernandez-Walton as new members of St. James. Afterwards the new confirmands were welcomed to the St. James Parish family with a celebration in Latta Hall.